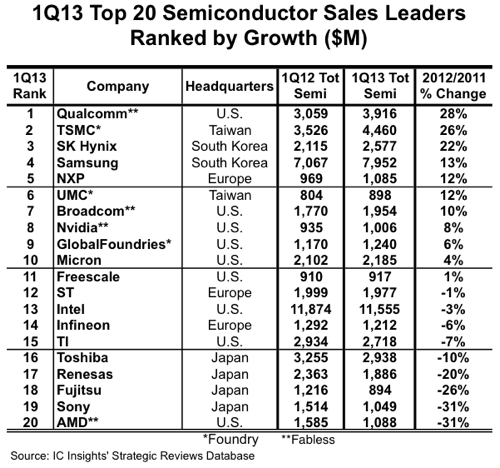 IC Insights has announced the top 20 worldwide semiconductor (IC and O S D—optoelectronic, discrete, and sensor) sales leaders for 1Q13 include nine suppliers headquartered in the U.S., four in Japan, three in Europe, and two each in South Korea and Taiwan, a relatively broad representation of geographic regions. 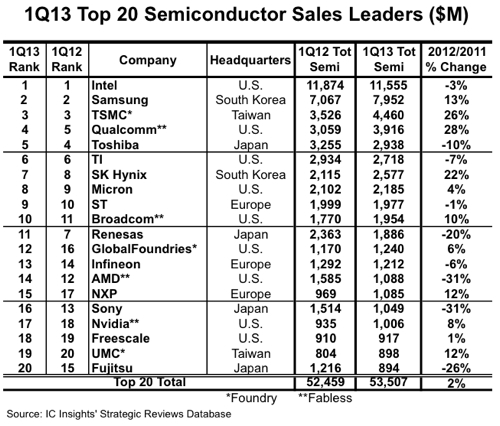 The top-20 ranking also includes three pure-play foundries (TSMC, GlobalFoundries, and UMC) and four fabless companies. By growth rate the top nine performers includes three fabless companies (Qualcomm, Broadcom, and Nvidia) and three pure-play foundries (TSMC, UMC, and GlobalFoundries).